How is the FF30X Plan different? - We'll show you! How is the FF30X Plan different? – We’ll show you! This could be the most important article on healthy eating that you'll ever read. Think that's a bold claim? Good. Keep reading. It's my #1 goal with this Fit Father Project website to change your health forever. That's why my Fit Father Project team creates the world’s best meal plans and workout – specifically for busy fathers over 40 who want to lose weight, build muscle, and live healthier for your families. In today's Free Guide, I'm going to introduce you to your new eating solution called “The Fit Father Diet.” This simple eating plan will help you lose weight the healthy way – without hunger, complication or frustration of normal diets. Watch the video I shot for you below to get started on today's training. What has your experience with ‘diets’ been like in the past…? Maybe you’ve tried a super low-carb diet like Atkins… but found that energy crashes, headaches, and restriction were not worth it. Maybe you’ve tried an “eat 6 small meals per day” bodybuilder's diet… but couldn't make eating and preparing food 24/7 work for your busy schedule. Maybe you’ve tried just “reducing your portion sizes,” but found that you hit a frustrating weight loss plateau and needed a more structured plan. Listen, if you’ve ever felt frustrated with hard dieting, I know how you feel. Even though I teach this “health stuff” for a living, I struggled with weight loss diets FOR YEARS before I finally figured out the principles behind this “Fit Father Healthy Diet Plan” approach that I'm going to share with you in this free guide. Fact #1: Losing weight and living healthier is really important for us guys. Excess body weight dramatically increases our risk of nearly every fatal disease (heart attacks, diabetes, cancer, Alzheimer's) by up to 81% (1). Listen, I saw this happen to my Dad. He neglected his health, ate unhealthy, gained weight, and eventually lost his life at 42 years young. As men, we MUST take care of our bodies and get healthy, so we can stick around to provide for our families, loved ones, and missions. Fact #2: Improving your diet is the #1 fastest way to get rid of belly fat and make your body healthier – inside and out (2). Nutrition is the foundation of your health plan. That’s why we will spend some time covering the most effective eating plan for you today in this Free Guide. Fact #3: As a busy guy over 40, you need a sustainable eating plan that works for you, your busy schedule, and your current metabolism. Any eating plan that's not simple, sustainable, and designed specifically for your body as a man over 40 is simply NOT an option for you. The GREAT NEWS is that you don't need to follow a hard diet, starve yourself, or sacrifice enjoying your life to lose weight and eat healthier. You just need the proper plan designed specifically for you as a busy father in your 40s, 50s, & 60s. The 3 KEY PRINCIPLES behind The Fit Father Diet. The “10 Top Fat Burning Foods” you need to eat to get rid of belly fat. How to TIME your meals with a busy schedule so you stick to your diet plan. How you start our Fit Father Diet & Exercise Program for the fastest results. Know exactly what to eat to burn fat and lose weight. Wake up feeling energized because your metabolism is working efficiently. Feel full and satisfied after eating – even though you’re losing weight. That's not fantasy. Those are the real results that thousands of fathers who are already using our Fit Father Diet Plan are experiencing. It's your turn now to discover these strategies and experience these results for yourself. To be blunt: any diet plan that’s EXTREME will never work for you long-term. Avoid restrictive diets – I'm talking about those super low carb plans that say you can't ever eat bread, pasta, or fruit without gaining weight. That's total B.S! As you'll see in this Free Guide, you can actually enjoy the right kinds of carbs daily while still losing weight. Avoid massive calorie cuts – crash diet starvation plans actually damage your metabolism (sometimes permanently) and lead to uncontrollable sugar cravings, energy crashes, headaches, and eventually falling off track. Avoid diets that promise short-term quick-fixes – you can’t afford to try another gimmicky diet where you lose 5lbs and end up gaining 10 back. You need a lifestyle plan that gets the weight off the healthy way – and keeps it off for good. Here’s what you need: you need a balanced eating approach on a plan that incorporates healthy foods you love in the proper balanced portions. Here's how to get started: Inside our Fit Father Meal Plan that’s included in our 30-Day Program, we hand you our balanced meal plan that shows you the perfectly portioned fat burning meals that will help you drop healthy weight each week consistently – without feeling starving or restricted. 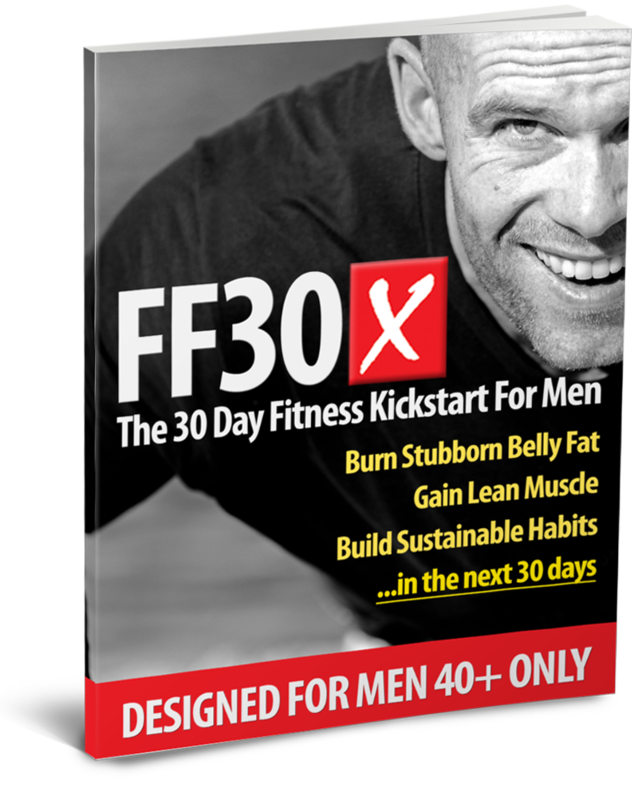 You can click here to read the Fit Father 30X Program Overview Letter to learn more. This link opens in a “New Window” so you can continue reading this guide too. That’s precisely why you need an eating plan that’s simple, quick, and effective to fit into your busy life – while still giving you the fat loss and energy you desire. Any diet plan that’s too time-intensive will not work for your busy schedule long-term. You've probably noticed this yourself from past diet attempts. You can’t afford to waste hours shopping for complicated groceries. You can’t afford to waste hours cooking complicated recipes. Instead: you must invest in starting an eating plan that’s simple, time-efficient, delicious, and actually sustainable. You can’t afford to follow a complicated plan that has you eating 6 small meals per day, buying over-priced juices, or swallowing pills and powders that are just wasting your hard-earned money. You need a science-based meal plan that is actually proven to work. A meal plan that is designed specifically for a busy father like you with an aging metabolism. We decided to call the program Fit Father 30X. The world's first & only fat loss and health transformation program designed exclusively for busy fathers over 40. The powerful meal plan that’s included in FF30X is called The Fit Father “No Think” Meal Plan. Eating the proper number of calories is absolutely essential for weight loss and lifelong health. To lose fat, you need to consume fewer calories than you burn each day. And every meal plan that “works” for weight loss helps you control your calories in one way or another. Now, instead of needing to count calories (which violates the “simple and time-efficient principles”), our Fit Father Project Coaches came up with a much more effective solution for you. We call it Building Perfect Plates. The “Perfect Plate” idea is a portion control strategy that shows you your ideal portion sizes for protein, carbs, and fats every meal to lose weight and feel energetic – without ever feeling hungry or restricted. • Fill ½ of your plate with any kind of veggie you love. • Fill ¼ of your plate with any kind of protein you love. • Fill the final ¼ of your plate with a healthy carb you love. If you follow these portion guidelines, your meals will roughly contain ~500 calories, which is an ideal weight loss starting point for most guys. The best part about this “Perfect Plate Strategy” is that there are literally HUNDREDS of different meals you can enjoy. Boredom and restriction are about to become a thing of the past for you. These are a few of our favorite Perfect Plates shown above from inside our Fit Father “No Think” Meal Plan that’s included in our 30-Day Diet & Workout Program. To read the Fit Father 30-Day Program Overview Letter and see what’s included in the program and how everything works, click here to learn more. When it comes to picking the right foods for your Perfect Plates, certain foods are simply better than others for burning fat and fueling your body. YES, you need proteins, veggies, healthy carbs, and healthy fats in your meals. We just need to make sure you’re getting the right kinds of foods in the right portions. The best fat burning foods are almost always unprocessed – meaning they typically don’t require an ingredient label for you to figure out what's in it. Sweet potato is sweet potato. These natural foods don't need an ingredient label for you to know what they are. Let's just say it's probably not quite as healthy as its manufacturers want you to believe. The key is to find the foods on this list that you love, and then prepare those foods with some simple recipes that you’ll use throughout the week. Fit Father Diet Secret #3: Follow a meal timing schedule that fits your unique work schedule. This “final secret” is perhaps the least discussed (but most important) part of your new healthy meal plan. The timing of your meal plan needs to fit your busy work schedule. Listen, you can have the best fat burning recipes in the world, but if your eating plan doesn’t fit perfectly into your busy work schedule, you won’t be able to stick to the plan long-term. Because we exclusively help busy fathers with jobs, families, and responsibilities, we had to come up with a solution to make meal plans work with your busy life. If you work primarily from home… you’ll want to follow our “At Home Plan,” which offers great ‘prepare-at-home' meals with more flexible meal timing. If you leave work early in morning… you’ll want to follow our “On The Go Plan,” which offers quick “grab n’ go” meals for breakfast and lunch – as well as healthy snacks you can take on the road. If your life is a combination of the above schedules… you’ll want to use our “Mix n’ Match Plan,” which combines the best elements of both plans. Whatever your specific work schedule, we have a meal timing setup that fits you. Seemingly small distinctions like these – such as the proper meal timing and the right kinds of fat-burning foods – will make all the difference in your results. On that note, I hope this free guide has helped give you some new ideas on what you need to be doing with your eating approach as a busy father. It's a fact: you can have your dream body and health at any age. Using our proven Fit Father 30X Program, our team has helped over 35,000 busy fathers over 40 lose fat, build muscle, and get permanently healthy for their families. If you want to experience similar results for yourself, you need a proven plan like Fit Father 30X that flat out works. If we're being honest, the best time to start getting healthier was 20 years ago. The next best time though… is TODAY. Don't wait any longer. That's what you've been doing for years. Our proven FF30X program will get you the results you want in record time. Click here to read the FF30X Program Overview Letter to see how our plan can help you get healthy – without the frustration of normal diets. The combination of the perfect meal plan, workouts, and accountability is why our program members experience such incredible results. I want to invite you to check out these testimonial video messages from some of our program members. These are Real Men + Real Results. Hear Ben's story above. *Results vary from individual to individual. These hard-working fathers finally found our FF30X plan, made the decision to invest in the program, followed along with our simple step-by-step system, and ultimately transformed their lives. Hear Nick's story above. *Results vary from individual to individual. If you'd like to be the next proud member of our Fit Father 30X Brotherhood, click the below link to take a look at our program overview letter. Hear Dave's story above. *Results vary from individual to individual. When you make the smart decision to give the Fit Father 30-Day Program a shot, we can send you over the complete program today. My team will get you instant access to the meal plans, workouts, accountability plan… and some incredible “surprise” bonuses. Really looking forward to seeing you inside your Fit Father 30X Program. P.S. After reading the overview letter, if you have ANY unanswered questions about the FF30X program, you will find our email at the bottom of the letter page where you can message us directly. Although we get hundreds of messages from men each week, we respond personally within 24-48 hours. P.P.S If you're not on the email list yet, click here to subscribe and join over 27,000 fathers and get a Free Copy of our 1-Day Fit Father Fat Loss Meal Plan.